This subject has been covered before, but after numerous requests and some positive encouragement from a good friend this weekend I have decided to post my version of homemade tonic water. The base for this recipe came from my friend Kevin Ludwig, who pioneered craft tonic water in Portland. His recipe can be found on page 76 of the March/April 2007 issue of Imbibe Magazine. This version is all mine. My problem with homemade tonic water has always been a flavor profile that was too esoteric for the general audience. This recipe takes some of the positive qualities people have come to understand from commercial tonic water and updated them with fresh ingredients. Try a few different suppliers for powdered cinchona bark to see which you like best. Tenzing Momo has great products as a rule, but their cinchona can often be floral, which may or may not work for you. You can also find cinchona from bulk herbal medicine retailers and other specialty herb shops. I find the yellow variety to be milder than the red, so adding too many other flavors to the mix can overpower the quinine. Adjust your recipes accordingly. Once you’ve mastered your own tonic recipe, you can begin to experiment with different spices and fruit flavors to pair with specific gins. For instance, I’ve found that beefing up the orange peel results in a tonic that pairs nicely with Hendrick’s, but try playing off the coriander or cardamom in other gins and see what happens. Combine ingredients in a medium saucepan and bring to a boil over high heat. Once mixture starts to boil, reduce heat to low, cover and simmer for 20 minutes. Remove from heat and strain out solids using a strainer or chinois. You'll need to fine-strain the mixture, as it still contains quite a bit of the cinchona bark. You can use a coffee filter and wait for an hour or more, or do as I do and run the whole mixture through a French coffee press. Once you're satisfied with the clarity of your mix, heat it back up on the stovetop or microwave, and then add ¾ cup of agave syrup to each cup of your hot mix. Stir until combined, and store in the attractive bottle of your choice. You now have a syrup that you can carbonate with seltzer water; I use my iSi soda siphon for some nicely-textured bubbles. To assemble a gin and tonic, use ¾ ounce of syrup, 1½ ounces of gin and 2 ounces of soda water over ice. How long does the syrup stay fresh in the fridge? Looks delicious – I’ll have to try this soon. I haven’t kept any around long enough to tell, but if you slipped a healthy splash of vodka into each bottle as a preservative, it should last a good long while. Note that this will preclude using your syrup as a non-alcoholic beverage, though. So you’re going to bring samples of all your homemade goodies to Tales, right? For you, Marleigh, I will definitely bring a little suitcase of vials for you to try. Promise! You have convinced me to add a soda siphon to my Amazon wish list (which means I’ll buy it shortly). I’ll second Marleigh’s request for bring a treasure chest of fun to Tales. By your recommendations, I think I might play with the quantities of sour citrus/lemongrass and pair with another citrus-forward Gin like 209 perhaps…any suggestions in this department? Oh dear, if anything can flush me out of my reclusive bunker, it will be this! Fine looking G&T. Best looking one I’ve seen. You wouldn’t happen to have a lemoncello recipe would you? I just finished making an awesome mojito using your recipe. Now I have to go order some bark and try this one, since a G&T is my favourite drink. Rick and Marleigh: It’s a done deal. Chris, I think with a big, muscle-y, citrusy gin like No. 209 you could cut down on the fruit in the tonic water and beef up a little spice. Try an additional half cup of lemongrass, drop the orange, swap the lemon out for a second lime, and throw a star anise in there. See what happens! Eugenia, hope to see you soon. David, thank you. Lemoncello is coming, I promise. Scott, drop a line here in the comments section and let us know how it turns out! Mary, try this and this. This all looks wonderful, Jeffrey, but it would be much more simple if you just made the syrups and gave them to me. I’m sure I could never create it as perfectly as you do. Jeff, you’d be surprised at just how well you can make this on your own. It’s honestly that simple. In the recipe, you specify 1/4 cup of the powdered cinchona bark, but all of the vendors that I can find sell it by the ounce. About how much do I need for a batch of syrup? I pulsed the spices in a spice grinder a few times to extract more flavor out of the seeds. Sorry about that. According to my digital scale, ¼ cup of cinchona bark is coming in right at one ounce. So you should add ‘mind reader’ to your list of qualifications. For the No. 209 pairing, those tweaks were almost exactly what I was thinking (though I’ll admit star anise didn’t spring to mind). Chris – I’ll be sure to polish up the old resume. Let us know how it turns out! Nice recipe, mine (http://www.tristanstephenson.com/wordpress/2008/01/03/tonic-water-recipe/) is similar but I don’t use the juice as shortens the lifespan of the syrup a lot. Lemongrass sounds cool though! Thanks for this recipe Jeff. I’ve recently bought a juicer to make ginger beer, and now I guess I’ll need to get a soda siphon to make my own tonic. I’ve been wanting to do this for a while but hadn’t found a good recipe until now. Two questions, though. First, is agave syrup readily available? I’m not familiar with that ingredient. Second, in the G&T recipe, is it 3/4 oz of carbonated syrup and then 2oz of regular soda water, or 3/4 oz of the non-carbonated syrup and then 2oz of the carbonated version. Sorry, I’m confused about which is which. Thanks again, can’t wait to try this! Is cinchona the source of quinine? I find that diet tonic–which does contain a bit of quinine–keeps my legs from cramping at night. Nothing else works. Quinine is on the “prescription drug” list and it apparently has a myriad of nasty sice effects. But diet tonic works for me–homeopathic, I guess. I’ve been able to find agave syrup a couple places, including BevMo! and Whole Foods Market. I’m sure you could find it at a more upscale supermarket in your area. Tristan – Nice recipe you’ve got there yourself! I, of course, don’t have a problem with the shelf-life of a syrup containing fruit juice, but I’m making twenty gins-and-tonics a night. The salt may mute the bitterness a tad, but it helps bring out all of the other flavors. It’s still nice and bitter. Chris W – That’s ¾ oz of syrup to 2 oz of carbonated water. You should find agave to pretty common, they’ve even got it in the bulk section of my neighborhood grocery store. Oh, ConnorH – Cinchona is the source of the quinine, but I can’t speak as to any medical benefits. I’m not a doctor. I’d love to try this with my new favourite gin — Bulldog! I wonder if honey could be used instead of the agave syrup? Has anyone tried this recipe with honey? Thanks so much for sharing!!! Honey is going to bring a lot of flavor to the party, but you could definitely give it a shot. I don’t know how much you’d use, but I would start with ½ cup in place of the ¾ cup of agave syrup. Don’t forget to let us know how it turns out! As a stand-alone Tonic water, not so awesome – a little too heavy on the bitter/sour side of the spectrum. It gets a little more manageable with an extra splash of seltzer. When I made a G&T with the last of my Distillery 209 Gin (& the extra spalsh of seltzer) however, it came out wonderfully! Didn’t need to add a squeeze of Lime to the drink & the anise and Cardamom came through on the finish alongside the various botanicals of the gin. All in all, pretty excellent – though I’m going to fiddle with some of the proportions – maybe a touch less lime, sub back in some lemon. Nice work, Chris! I think mine’s probably a little sweeter/fruitier with the orange I used (actually a Tangelo), so that explains it. Have you tried yours with Aviation gin? I’d think that the creamy sweetness would offset the bitter/sourness in a pleasant way. It’s funny – I’ve been looking for Aviation for a little while now but to no avail (who distributes that outside of Oregon, more specifically to the greater NJ/NY area?). I’m sadly also at a loss for more #209 – probably should’ve scaled the Tonic recipe down a bit as I’ve now got a big bottle of tonic, but no more 209 left to mix it with. On the creamy v. bitter/sour note – the tonic mixes passably well with Plymouth – the ‘velvety’ character of it does kind of what your saying. Sadly, the flavor of it gets a little bit overpowered – not bad, but not quite what the 209 mix was. I’m wondering how a Genever would fare here – I’ll check that out next. I don’t know about their distributorship, but you might check their website. I can see Plymouth going well with your recipe. I’ve got a bottle Genever here at home, so I might have to bring it to work tomorrow night to test it with my own. On a side-note, the folks that produce Aviation tell me that they intended for it to be a Genever-style gin, so you might be on to something with your experiments. Let us know how you fare! We tried the tonic recipe–so refreshing on a hot day! But a weird thing: If we put the soda on the syrup it foams up like crazy, but syrup into soda was no problem. I should have mentioned this in the original post, because you’re right, the mixture will foam up if you blast carbonated water directly into the syrup. An old bartender’s trick is this: squirt the soda water into your cocktail shaker (or any other vessel) and then slowly pour the carbonated water into the glass containing the syrup. Voila, no more foam. Where can I find cinchona bark? Is there a website where one can buy online? Great recipe… I haven’t tried this yet, but do you think running the cooled down base through a Brita water filter would kill the taste? I don’t know, but as much of the point of a Brita is to filter out impurities, I can see it removing much of the flavor. Only one way to find out, though. And thanks for the link, it’s good to have more options and that price looks quite reasonable. I’m a bit confused as to how you’re carbonating the tonic. Do you add water and syrup to a soda siphon, or do you keep the syrup in a separate bottle and simply add soda from the gun? Seriously, though, you could do both. I keep my soda and syrup separate for this one, but that’s just my personal preference. There’s no reason why you couldn’t fill your iSi soda siphon with the right proportions and go. Batch one following your recipe turned out pretty darn good. Nice call on the French press, all other stories of homemade tonic I’ve encountered involve hours of slow straining. Batch two is on the stove now and aimed towards the cucumber notes of 12 Bridges gin. I cut back on the citrus and allspice, bumped up the lemongrass and added dried lavender. I’ll let y’all know how it turns out after my shift tonight. With a little luck, I can convince my managers to start putting house-made tonic on the menu. Nice work, Andrew, and good luck! The only thing I’m a bit surprised by is the filtering. I expected it would be a hassle, but it’s pretty remarkably how suspended in solution all the bark particles still are even hours and hours later. I tried the French press, but the liquid is still opaque. I tried coffee filters, which, as you suggest, are mostly useless. Are you seeing different results with the French press, or do you settle for an opaque syrup? Kolbe – I settle for a slightly opaque syrup. If there are particles still in suspension, I don’t consider it a major cosmetic flaw, and by the time you water it down with gin and soda, the particles become pretty much negligible. Jeffrey, thanks for the recipe! It turned out really nicely for me and I’m looking forward to sharing it with my friends. I’m sipping my second G&T, this one with Rogue spruce gin–a nice complement. I do find that the allspice makes it a little too..yule-tidy for my taste. Is it needed to mellow the bitter of the quinine? Do you have a suggestion for a substitute? Hey Chris Hansen – You know the rules around here. Don’t like the allspice? Leave it out. Seriously, you could try juniper berries, cardamom, coriander, whatever you like. Just be sure to come back and report your findings here. I worked up a derivative of this recipe. It turned out tasting almost tea-like, which took a couple G&Ts to get used to, but the added nuance was appreciated. I’m going to throw in some juniper berries next to see how if accents the juniper in my gin. I left out the lemongrass, orange and allspice in my first recipe. One thing I wasn’t ready for was the lack of sweetener in it. The store bought tonics contain loads more sugar than I realized, so I’m going to make up a batch of the simple syrup to add. Once you’re satisfied with the clarity of your mix, heat it back up on the stovetop or microwave, and then add ¾ cup of agave syrup to each cup of your hot mix. Stir until combined, and store in the attractive bottle of your choice. I ended up liking leaving it out, as I could easily flavor the sweetness, depending on my mood/food. I just got done making the tonic recipe again, and didn’t go through with the sweetener, preferring to add it as needed. One thing I don’t understand is if the purpose of the citric acid is to act as a flavoring agent to give the tonic ‘bite’, or if it’s there for it’s preservative qualities. It’s been a long time since you made it for me, but I just have to reiterate how amazing this tonic water recipe makes a gin and tonic. The drink Jeffrey made me in New Orleans was easily the best G&T I’ve ever had. Aw, Dood, that’s the best way I could have started my morning. Thanks! And, Tom, the answer is yes. Can any of you help me with a good recipe for 12 bridges gin? We made it just to drink out of a glass and I’ve been asked to make a cocktail. 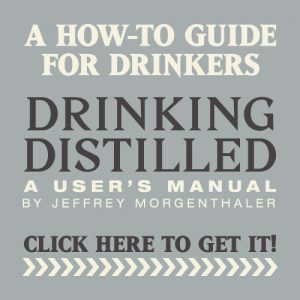 I’m a distiller, not a mixologist! So – as someone who has not typically liked G&T in the past, but loves the taste of this tonic, can you recommend a good beginners gin, for up to $50/bottle? Mark – Try Rich’s (above) 12 Bridges, Aviation, Martin Miller’s, Beefeater, Plymouth, Hendricks, Tanqueray No. 10, or wait it out and see what everyone else has to say! Interestingly, I actually have a bottle of Tanqueray #10. I picked it up a few months back for cooking – I had a recipe that called for a gin-based marinade. I didn’t realize when I bought it that the #10 was anything different – just needed a marinade for a steak, and tanqueray was a familiar brand. I just gave it a try; interesting. Not my favorite – but I can definitely see why it’s so traditional with the tonic. It blends nicely with the bitterness, and really brings out the citrus. But the cardamom that I put in my tonic clashes with it – too much citrus with the spice of the cardamom. mrParker – I use straight agave nectar. A 1:1 syrup would just bring too much additional water to the party. thanks jeffrey, the tonic turned out better than expected. i ran it as a special paired with hendricks last night and received nothing but fantastic feedback. also really enjoyed it with the m millers westbourne. good luck with the move to cc. As far as gin is concerned, I really like the flavor of the Cascade Mountain gin. It’s made in Oregon and flavored with wild juniper berries. I prefer it over the gins I’ve had (aviation, beefeater, hendricks, a few others). About 9 months after my first Bel Ami House G&T, I’m finally making my first batch of tonic. Excited. I am planning on making this on Friday after work. I am concerned with preserving it for as long as possible. Thus, I plan on storing half in freezer. However, doesn’t the citric acid preserve the mixture for about six weeks in the fridge? Thanks for posting all of this information. I made the recipe, using a metal strainer, followed by a french press. The french press seemed to remove very little compared to the amount still left in suspension. I was left with a maroon colored liquid prior to adding the agave. What is the color of your liquid before adding the agave? Do I have the right color or is there another way to make it more clear? Btw, I used cinchona bark from tenzing momo like you used. Also, coffee filters were pretty much useless to break out the powder left. I used a coffee press as well. I usually stop after that, then let it settle overnight. After that, I just decant and pour as I go, and don’t worry about the solids at the bottom. Thanks Tom. I have a reddish batch sans agave sitting in my fridge. After it settles, I plan on just pouring off the top and discard the liquid holding most of the powder on the bottom. Looking more closely at Jeff’s G&T pictured above, it is possible that the reddish color of the tonic liquid prior to the adding of agave is consistent with the recipe since the G&T has lots of clear liquid lightening the color of the drink. Can’t wait to try this recipe! Has anyone tried sweeting the tonic with Stevia? I bought all the ingredients and am ready to go – except I don’t have a soda siphon. Is there any way to make this without spending $70 on that? JC – Get yourself a seventy-nine cent bottle of club soda and add two ounces of the stuff to three quarters of an ounce of syrup and two ounces of gin. Squeeze some lime on top, with ice, of course, and you should be fine. After much searching I found a place that sells cinchona and is not out of stock. They disclaim, however, that this product is for research or collecting purposes only and is not for human consumption (I do not actually collect powdered bark, and if I did it would be cinnamon). They appear to have these disclaimers on things that are(or are similar to) prescription or restricted drugs. But I’m not entirely secure about the stuff now. So, it turns out that the aforementioned disclaimer is solely due to the cinchona itself and not any adulterants or whatnot, so we’re go. I’ve got a batch cooking now with some juniper, cardamom and lavender in addition to the listed ingredients. 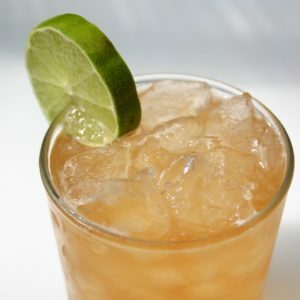 Any place to get cinchona in Portland??? Well, after a year, I finally made this. I was never a fan of gin and tonic, but I have to say, this has changed my mind. One stalk of lemongrass (in MN) was only enough for a half recipe. I filtered ten times through paper towels before using a coffee filter with good results. Now, I love a gin and tonic using Tanqueray Rangpur. Wonderful and refreshing! Thanks, Jeff! I am planning on making this; I finally got my bark powder and just need to fetch some lemongrass and find me some time. My question: I wonder if anybody’s tried using their espresso machine to extract the quinine, or would that just gum up the works in my machine…? I was too nervous to try my espresso machine, so I divvied up the powder into two coffee filters, which I twisted up and tied with kitchen string. Still lots of filtering to do (one tore a bit so I had to transfer the mud to another filter packet), but it’s coming along nicely. Next time, I will try to located make-your-own tea bags. Well, Houston, we have touch-down. I just served my significant other and me a couple of G&Ts using Jeffrey’s recipe (sans citric acid). I just made my first batch.. Needed a lot more agave syrup (a little more than a cup) to balance it out at least a little. The allspice berrys smell like christmas, why are they in the recipe? I feel like it destroyed the whole fresh tonic water citrus odeur. Otherwise a realy nice recipe, thanks! 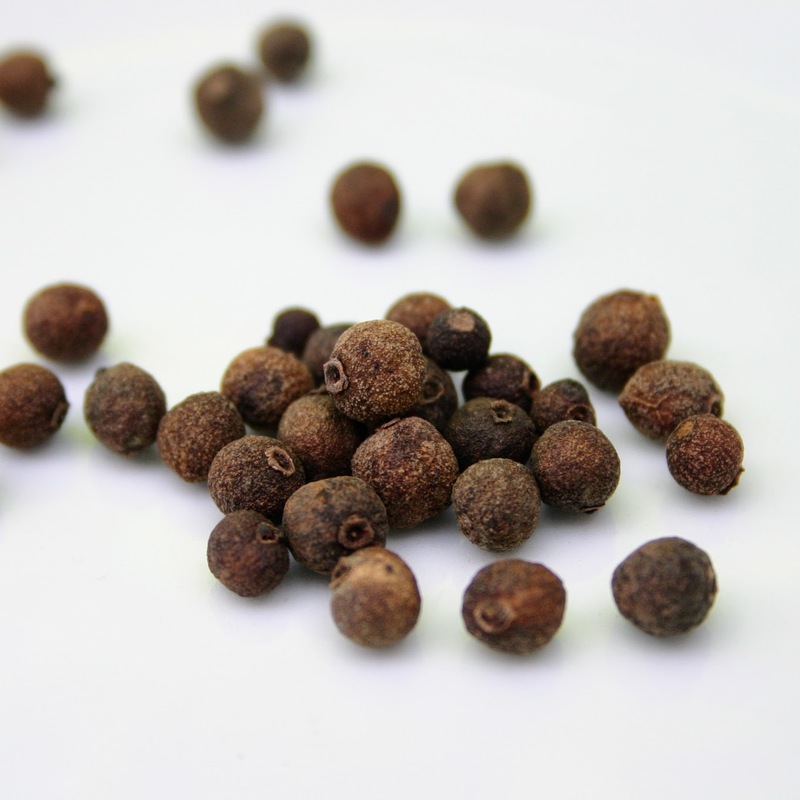 If you don’t like the allspice, take it out! I’ve made about 6 batches of this so far, and I haven’t used exactly the same ingredients twice. I’m loving playing with it. Most most interesting variation was adding pomegranate molasses instead of lemon juice. One of my lemons was unexpectedly rotten on the inside, so I went hunting for something else with a pleasant sour flavor. I saw the pomegranate molasses, and threw in a good-sized dollop, to approximate the amount of sourness from the lemon. The result was interesting. Personally, I tend to prefer bourbon and tonic to gin and tonic; with bourbon, the pomegranate flavor really didn’t work. But with Tanq#10, it’s terrific. Can you use quinine bark tea? Zooscape sells this and it seems like you could avoid the straining issues by using it. Not wanting to poison myself with quinine, does anyone know how much is released from 1/4 cup of bark and how many ppm is in the finished drink? I’ve heard citric acid is a form of MSG, what can I substitute in its place? That was another reason I was considering using the tea instead of powder. It seems that with all the powder that is left, the amount of quinine would be high. I made two batches recently…the first was awful – epic mistake. The second came out alright, except that it’s excessively bitter. I think some commercial tonic waters are fairly gentle in terms of bitterness, but this one I could hardly choke down more than an ounce or so. Is there anything I might have done wrong in the preperation process? Boiled it too long? The citrusy tones are really good (I added some coriander) but the bitterness is intense. And there is a distinct bile-y note to it. Made mine up with the addition of several cardamom pods and the zest and juice of 1/2 of a grapefruit. I filtered through a French press and then through a paper towel layered over a coffee filter. Color is beautiful. It came out quite strong – I am using 1/2 of an oz of the tonic with 2 oz of gin and 2+ of soda water to get a good balance. Very nice in those proportions. I think I overdid the cardamom, though. I’d probably use no more than 2 pods in future batches. True. Try substituting with a little organic cider vinegar for the citric acid. Richard, whoever told you citric acid is a form of MSG is either woefully misinformed or is messing with you. MSG is monosodium glutamate, a salt of a naturally-occurring amino acid (MSG itself is produced in weird industrial processes and is basically to natural glutamate as high-fructose corn syrup is to fruit juice). It has a flavor termed umami, found in the taste of soy sauce, marmite, Parmesan and other cheeses, meat and meat broth, tomatoes, etc. Citric acid, on the other hand, has a sour flavor (it’s also called “sour salt”). It’s basically the taste of citrus fruits, except without the sweetness or the different molecules that make, eg, limes taste different from oranges. Anyway, you certainly wouldn’t want MSG or free glutamate in most cocktails (the Bloody Mary and the Caesar excepted), but citric acid is good. Malic acid is also okay. I tried making this recipe without citric acid, and it was really missing a big part of the flavor profile. You’d have to use a *lot* more citrus in the recipe if you omit it. I’m waiting on my quinine order. I’m planning to use basic herb tea ratios, 1 tsp to 1 cup water, so a TL of 4 tsp for this recipe. Of course this will probably throw everything else off and need more readjustment. I think it’s important to remember that tonic water started out as a remedy for malaria, it’s medicinal. Colonials mixed it with gin to make their daily dose of medicine more palatable and it IS possible to overdose. citric acid is not at all related to MSG. Acids make things tart, there is citric acid naturally present in lemons, limes and other citrus (see name similarity) fruits. MSG is Mono Sodium Glutamate, it is a umami or savory taste enhancer. There is nothing wrong with eating it either, it is some amino acids combined. Amino acids are present in food naturally, and yeast or miso paste naturally has the amino acids present, giving a similar flavor effect without it being MSG. The ONLY similarity to citric acid and MSG is that both can be white crystals. But then again, so are salt and sugar. Go ahead, use citric acid. I highly recommend it over others, vinegar would ruin the flavor for example. Too much juice may throw off the balance. Hello Jeffrey, I am pretty lazy. Where can I purchase traditional tonic water in the U.S? I found sites in London but not one here. Anyone know where you can buy cinchona bark and citric acid in NYC? I’ve been to quite a few shops and haven’t found anyone who stocks the bark. 1. My cinchona came as intact bark, rather than powder, though I sent it through a food processor for a good while before using it. 2. The recipe doesn’t specify dried or fresh lemongrass. I’m using dried. 3. The recipe doesn’t specify citric acid salt or citric acid solution. I used 1/4 cup citric acid salt. Let me know what you think; I am determined to get this right. Also, is there any way to make the final syrup colorless? That would look extremely polished! I used fresh stalks of lemongrass. Used citric acid salt (dry form), and I used the powdered cinchona bark. All of the rest to the letter of the recipe, although my stalks of lemongrass were small so I only made a half batch. Results: excellent! Bitter, sour and sweet in a strong but balanced combination. I go about 2/3 ounce of the tonic to 2 ounces of seltzer. 10 times filtered through paper towels and finally through a coffee filter yeilded a light brown. I dunno how to completely eliminate the color, but for me and my guests that try it, the color adds to the experience that this isn’t your typical G&T. I look forward to experimenting with the ingredients in the next batch. Has anyone tried using barley malt extract or honey as the sweetener? I am curious about how that might work. I just made it, photographed the process, and posted it to Instructables. Thanks for the recipe and guidance, I am so jazzed about this. I hope this question isn’t incredibly inappropriate but I find that no one else has asked! I drink vodka tonics but I heard from someone that tried this recipe that it’s a bit heavy for VTs. Jeff, do you have any recommendations knowing this? I hope I don’t get dagger stares, I’m just not a huge gin fan! Just tried it with some strong juniper genever. PS: concerning storing; how about using Vitamin C instead of citric acid and adding it after the boiled liquid has cooled down. This should 1. be healthier because of the temperature sensible Vit C and 2. also help as preservative. This is marvelous information. I’m ready to do some experimentation on my own as soon as I can find a source for the bark (I’m thinking there’s a local spice merchant/brewer who will carry it). I’m wondering, though. You’ve discussed making the tonic with the syrup and water from a syphon, or with club soda. I’m wondering if there’s a third choice. What would it be like if you brewed the tonic, like your ginger beer? Would you need to boost the sugar content to feed the yeasts? Would it come out tasting too “beery”? So I went backpacking a couple weeks ago and bought myself a bottle of Aquavit (by local distillery House Spirits) as the elixor of choice for my flask. Fast forward to today, during a conversation about what tonic water is the best with Tanqueray 10. Of course, I am not nearly so picky… By my mother & her best friend have this borderline obsession with 10 and you’ll just have to trust me that they are really quite snobby about it. Anyhow, I am reading the Wikipedia entry for tonic water, and I see that somehow you can get a more traditional-style tonic, which is less sweet and more bitter. I’ve taken to ordering gin gimlets for this very reason… Because I prefer a tart/bitter drink to a sweet one. So I do a Google search in my attempt to see if I can find a brand of tonic water that will be more of a thorwback to olden days, and this blog entry comes up. I click on it, and what is on the sidebar? The “Norwegian Wood” entry. Which brings me back to the Aquavit, and how strange the whole thing is… Because the backpacking trip is over and I was wondering what, if anything, I could mix it with, or if I would resign myself to drinking it straight. So then I read the entry and thought to myself how much I would desperately like to try that drink… Only to realize, d’uh, I live in Portland and maybe I can actually go to Clyde Common and beg you to make it for me (since I don’t have any of those other ingredients and know that I am probably not motivated enough to go get them). Karl – You can indeed bottle-ferment the tonic water, but I would recommend bumping up the sugar content a notch to feed the yeast. I don’t know how much to recommend, but play with it and report your findings back here if you would. Jessica – We’ll be expecting you for either a housemade tonic, a Norwegian Wood, or both sometime in the near future. I’m also curious about using Stevia for the sweetener. It has a bitter undertone that I don’t like for most things, but that might work great in tonic. Hi Imho, it should not be fermented, it won’t be tonic anymore..but an alcoholic beverage. The fermentation would also add different flavours. I need sugar-free tonic to help keep lower the glycemic index of G&Ts. 45 different flavors of sugar-free syrup are available at http://www.davinci.com, but none are agave-flavored, (and some would be completely disgusting in this recipe. Suggestions? I love it, Jeffrey. I made my first batch as a gift (along with a lime tree and a bottle of Atlantic) and I immediately made another one for myself, with a few alterations: added juniper berries, crushed cardamom, and caraway seed. I’m not sure that I taste the juniper or cardamom, but the caraway shines. I also substituted a little brown sugar for some of the agave. It’s just wonderful. AND BONUS…I’ll be malaria-free! 4 cups are roughly one liter, so I went with that for the water. I did not powder the chichona bark because I am too impatient to filter that stuff out and I was too lazy to powder those cinnamon like sticks (and because I did not have any tools around). I broke it into smaller pieces. Then I put one tablespoon of allspice into the pan because I somehow misread that. I was really confused about the citric acid. I know the liquid one and I got cristalline form at home. After I mixed it in there, I read, that this would give me 80ml Of lemon Juice if mixed with 80ml water. bummer 😀 (or not?). And then I ran out of luck because I have browsed the syrup shelves in Germany enough times to know that there won’t be any agave syrup around. So I picked the solution with honey. I picked acacia honey, because you can get it everywhere (at least where I’m at) and it is a very mild one, nearly tasteless but sweet. I chose to follow your recommendation and mixed one third (in volume) honey with two thirds “tonic”. Now I am looking at roughly 1,2 liters of tasty tonic syrup. It is sweet and just a little bitter. That is because I did not powder the bark, I guess. And because I just took the last bottle, in which there is a little more honey than in the others. I like it. I hope the others will be less sweet. Otherwise I will post again, when I do it over with less honey. And better prepared. you are so AWESOME for posting this. this is gonna rock the halloween party ! But i was wondering, where is the quinine in there ? I’m about ready to give this a go, but I had just a couple questions. First off, I could only come up with dried lemongrass; should I alter the quantity I use? And secondly, is that 1/4 cup of citric acid in a powdered or liquid form? I have the former…if you used liquid, would you happen to know the solid equivalence? I’m really excited about this project…thanks for posting the recipe! Jean-Michel, the quinine is in the chinchona bark. Anyway, more to the point, I see several people here discussing the safety of this stuff, and I have to say I find it extremely unlikely that there’s any danger. According to the oracle the real, medicinal tonic was between 200-400 times stronger than what they FDA will let you sell as tonic water today. Sure, I’m betting (hoping, really) that this recipe has more than 83ppm quinine, but I still strongly doubt it has more than, say, one order of magnitude more. In which case we’d still be talking about pounding 20-40 G&T’s to get just one medicinal tonic dose. At that point, I’m going to go out on a limb and suggest that the toxicity of the gin should probably be your primary concern. Has anyone tried this with pure Kosher grade quinine? You can get it from Sigma-Aldrich. It would probably make a clearer (possibly less complex) drink, which may be preferable to some (not sure about myself, I’d have to try). I’ve looked and everyone seems to use the bark. Is there a reason for this? I went ahead and made a batch, using 1/3 cup of dried lemongrass and no allspice. Unbelievable. It was like I had never had a gin and tonic before. Jeffrey, thanks so much for posting this; you’ve improved my life. @Cisco: I think the reason nobody’s using quinine sulfate is because it’s regulated as a drug and it’s frighteningly expensive. The site you mentioned wants $160…although it doesn’t say how much you get for that price. If there was a cheap source for the stuff I might give it a go. But really, I kind of like using the bark. It’s like a “proto-tonic” or something; the Raj already had isolated quinine sulfate when they invented the G&T, so we’re going back to construct one like it “would have been” hundreds of years before it was invented. Wrap your brain around that! Oh, and also I think the look is super cool as well…definitely drives home the uniqueness of what we’re doing. I ordered dried lemongrass and yellow chichona bark. They called and the bark is now only available in 10 lb. lots. I had to then order from herbaladvantage. Sorry, I ordered the lemongrass and bark from blessedherbs. They then returned the call saying the bark is only available in 10# lots. I am now drinking a wonderful G&T w/o sugar. Hey I just got a sodastream carbonater to replace my old ISI(which I love, by the way). The only problem, is although they have a large selection of soda flavorings, they all have splenda in them – even the non-diets, a taste I fond unpleasant. I’m glad to find a tonic recipe, but is there anyone making a (splenda-free) tonic syrup out there for purchase? I have been unable to find citric acid in the store. I did find true lemon which has citric acid as it’s top ingredient. I am just not sure how much to use. It says that one package equals 1 teaspoon of lemon. I am thinking that I will need like 30 packages? I just tried this recipe using Peruvian Bark Powder ordered from the Herbal Advantage website. The resulting concentrate (without adding agave or any sweetener) is a deep opaque crimson after straining twice through a gold-plate coffee filter and cotton cloth. I did also leave out the citrus juices, trying to keep it as low carb/low calorie as possible. Oh and I couldn’t get a screw-top CO2 charger for the soda siphon I got at a local antique shop, so I just used the Pellegrino knock-off from Whole Foods (their Italian soda water). Great! FYI: the link above to Tenzing Momo is to c/s not the powder. I just got my 1lb of Cinchona C/S whatever that is. It looks like it’s chopped into larger pieces. Is it useable? Or should I try to return it? I’ll follow up my own post for anyone who cares. I called Tenzing Momo, and they said it was the same stuff if I ground it up. I put it in my spice grinder (old coffee grinder) and gave it a whirl. Currently waiting for it to cool down and trying to strain. I think that’s going to be the hard part. I made my batch using tensing momo’s powdered cinchona. I’ve strained and strained and no change to the clarity of the liquid. At this point, I’m just going to give it a try and hope that I don’t have to much quinine in it. Next time I try this, I’m going to use whole bark, slightly ground, rather than the powder (which was way too finely ground). Made a batch last night and it’s fantastic! It’s excellent the way it is, but I think I’d like to play with some of the flavors because, well, I’m a tinkerer. Just like to play with the possibilioties. The agave syrup is critical here. Great call on that. It lends a softer sweetness than simple syrup would. Nuriah– If you’re leaving out the fruit juice for calorie concerns, your giving up a lot of flavor for almost no caloric advantage. One each of a lemon, lime, and orange adds a total of about 100 calories to a mix that makes a minimum of 40 drinks. That’s 2.5 calories/drink. There’s no way the flavor trade-off is worth 2.5 calories. By the way, in Seattle, cinchona can be purchased really cheaply at Dandelion in Ballard. The guy who sold it to me knew exactly what I wanted it for and had made tonic water himself, so we had a nice chat about it. Really good guy. Also picked up the citric acid and allspice there. Got enough of everything for four batches for about $12. When googling myself (who doesn’t do that from time to time?) I have -not surprisingly- stumbled over you, good sir, a few times. That tonic sounds incredible. I’m not really a drinks expert, but I’ll be checking some of these recipes out for sure. Keep up the good work! Found this site this weekend and ordered supplies. Really getting excited about this project!! Thanks everyone. Mine turned out really good (despite the straining issues). Makes me want to experiment with some new flavors. Alas, I am out of gin. I was able to put my cinchona into a spice grinder (old coffee grinder). The end result was delicious. I’m also excited to try another batch, so I’m giving away small bottles to people who like it. I’m thinking grapefruit for sure, replace the allspice with something else…suggestions? oh, and I wouldn’t attempt this without a french press strainer. Where are you getting the cinchona? I ordered from Rain Tree and they cancelled the order the following day since they were out. I got my cinchona from Tenzing Momo. I followed the link Jeffrey provided to their “c/s” version, which seems to be more shredded than finely ground. Worked great for me. I’m curious, has anybody come up with a Bitter Lemon recipe based on this tonic recipe? I’ve been at this for about a year now since finding this. I love the recipe, although I tweak it here and their. One thing I do is cold brew the cinchona with just the citric acid in six quarts of water (I do double batches). I leave it at room temp and shake occasionally for a day or so. I then put it in the fridge overnight and the bark settles to the bottom. I then take a liter water bottle with the bottom cut out. I unwrap three cotton balls and stuff a thick portion of this into the neck via the bottom (I use a sharpening steel). I then insert the neck into that of a larger bottle, after which I decant a portion of the brew through the filter apparatus. Be careful not to disturb the sediment. After most is passed through, I can finish off that last little bit. The cold brewing is more selective. You get all the quinine, but less of the bark taste. You still get a deep red hue and great clarity. I brew the other ingredients in the remaining two cups of water on the stove and run that through a gold coffee filter. For pristine clarity, run it all through the cotton again. It will go quite fast this time. Along with many of you people I find commercial tonic water far too sweet and have been enthused by the contributors to this site. My problem is that I cant find cinchona powder in the UK. I have found a source for a it in liquid form (a tincture). Does anyone know if this can be used as a substitute and if so what the comparison on quantity used is with powder? Tinctures are alcohol based infusions which usually come in small bottles. In theory it might work, but I imagine it would take quite a few bottles of tincture and would be very expensive. The result would probably be clear, rather than reddish brown. Thanks very much for this Ken. It sounds as tincture isnt very practical so I have been in touch with my sister who lives in California. She has found a source of cinchona in ”chopped” form. Im not sure how finely it is chhopped, but if anyone could provide any advice on whether this would do the trick for tonic, I would be very grateful. Chopped, I think, will work fine. What is going on here is an acidic extraction. Quinine is an alkaloid, which is an alkaline compound derived from a plant. This reacts with an acid, in our case citric acid. A salt is formed, quinine citrate, which dissolves easily in water. If you use the cold brew method, which I really like, you might give it an extra day to pull out the quinine. Alternatively, you could grind the bark down finer with a blade type coffee grinder to speed things along. I should mention that when I brew, I don’t add any sweetener until I’m done. I add agave or organic sugar simple syrup along with the tonic concentrate to the water prior to carbonation. An interesting note is that the form of quinine in the tonic water depends on what acid is used in the process of making it. Most commercial tonic water contains quinine hydrochloride, which indicates it was made with hydrochloric acid. Here, we’re using citric acid, which results in quinine citrate. Good luck, and thanks Jeff for the best homemade tonic page around! Thanks very much Ken – you guys are brilliant! I have a consignment of cinchona on its way from California and I cant wait to get going on it. I’ll let you know how I get on. I’ve been doing this for about a year now. Always comes out fantastic. Best gin and tonic you’ve ever had, hands down. I’ve written up my experience here. I have been planning to attempt making a batch for over a year. After a friend ordered the bark for me (probably to make me stop talking about it and to let him him tasting it) I am finally starting my first batch today. It is coming to a boil as I type. Based on that I read here and related posts I have already modified the recipe without trying the original.. I only have dried (with hardly any odor) lemongrass am not using citric acid (So I up-ed the citrus a lot). Added peel (microplaned)of 2 lemons, 1/2 grapefruit and (using a citrus zester)4 limes. As for the juice I added the juice of 4 lemons and 4 limes. For spice I added about 5 allspice balls a tsp of conriander ~10 cardamom seeds (not pods) and 5 juniper berries, in addition to the bland dried lemon grass (I tried to find fresh but failed). I will report on how it worked out. You have a good friend! As for the citric acid, I really don’t think there’s a good substitute. More lime juice may help, but the rinds will only add citric “essence” when what is needed is acidity. When you obtain citric acid, keep in mind that it is much denser than the chinchona. With a 1:1 ratio of citric acid and bark by volume, I’ve found that I need about 2 lbs of citric acid for each pound of bark powder. I got 5 lbs of citric at a good price on ebay from a supplier of biodiesel products! Yes, it’s food grade, lol. Personally, I’ve dropped the lemongrass due to availability and local prices and instead use crushed coriander seeds (about a Tb). It cost me about $100 by finding a used 20 lb tank on craigslist and buying a regulator, but it’s very cheap to carbonate beverages (like 2 cents a liter) and has more uses than just tonic water. While reading this I am sipping on a gin and slimline tonic, I’ve just added the ingredients to my next shopping list. I’m really excited to give this a try, though I admit I’ve had a hard time finding the bark in NYC. Its rare that I strike out with Kalustyans. But I’m excited because I’d love to have a tonic water that was less sweet. Great article though! and glad to see so many other comment-ers are enthusiastic about good tonic water too! Just found this thread. Been making tonic for a while. My recipe, which is changing every time of course, is quite different — cardamon, coriander, juniper, 4 lemongrass stalks, zest and juice of lime, lemon, orange and sometimes grapefruit, much less citric, a touch of sumac for citric tang, no allspice and so on. That’s neither important nor why I’m here. Filtering is my point. I really want a clear syrup. I think a lot of the bitterness of the bark remains if its not filtered adequately. Seems to be a major problem for most. If you’re lucky enough to have a chinoise, you’re golden. I borrowed one once and couldn’t believe how well it worked. But the damn things are pricey. For the rest of us, try a sieve first to get out the big stuff. Press out as much liquid as you can. Then filter through 4 (or more)layers of cheese cloth. Then a coffee filter. Even so, I’ve sometimes had to pour off the liquid from the top of the coffee filter after several hours into yet another coffee filter. That works. For those of us in Europe, Cinchona bark can be sourced from Luminescents, a UK-based company. They also have a wide array of other essential oils, spices, herbs, etc. If I use the soda siphon do I still need the soda water? Thanks for the recipe can’t wait to us eit. I’ve been using this for 6 months now… only problem is that friends want me to make theirs. I’ve experimented with cooking up the chinchona bark separately (in 1 1/2 cups water) filtering this and then adding the liquid to the other ingredients. I filter with a series of Melita #6 filters in small lots and squeeze out the liquid from the dregs with my hand. I end up with 1 cup of good chinchona liquid. When I mix this with the other ingredients I can filter the final batch more or less to preserve some of the citrus juiciness. Is it possible to just get pre-extracted quinine (and where)? Then just add quinine to some sparkling water and the rest of the ingredients? I’ve taken a different tack altogether – no water and no cooking – just an alcoholic infusion. To about 250ml gin I add 2 teaspoons finely chopped (not powdered) yellow chinchona bark, 1 teaspoon citric acid, 2 whole cloves, 2 cardomom pods, the thin peel of a lime and a lemon, and a pinch of mace. I leave the jar in the fridge for 3 weeks, then add about 100ml agave nectar. After another week I pour the liquid through 2 layers of muslin into a stoppered bottle. To serve, I take half to one shot of the flavoured gin, 0 to 2 shots plain gin, and top up with sparkling water. (I prefer it on the bitter side, so I keep the agave to a minimum – most people like more). Also an FYI that at herbaladvantage.com they have the Cinchona (Peruvian Bark Powder) for $13.80 a pound plus most the other ingredients, like citric acid, allspice, and lemongrass. I don’t know how you are suppose to know how much quinine concentrations you can get out of the bark but at least nobodies likely to overdose this way. Guys, I’ve read all the above comments, and what is most frustrating is people’s illogical desire for a “clear” tonic… Bottom line is if your using ingredients such as lemons, oranges, allspice and bark, you will NEVER get a clear product. The way commercial bottlers do it is they utilise food grade oils, essences and extracts which have been manufactured in a lab, and then chemically bound with water (so they do not separate)… And more often than not, these oils are artificial and synthetic, which is why the end product (i.e. the Tonic Water) comes out “crystal clear”! Stick with the natural products (for your health’s sake) and don’t give a damn if the end result ain’t so “clear”! The lack of clarity in my experience is due to the chinchona, which is really hard to filter, and greatly affects the flavor (too bitter). Also is rough on the throat. I’m going to try a 3 or 5 micron ceramic or paper (not charcoal) camping filter to see if I can clarify mine. Is it possible to get lemongrass now in the winter? I’m in the D.C. area – does anyone know where I can find it. Local grocery doesn’t carry it now. Thanks!! Kevin, I picked up fresh lemongrass at an asian market two days ago in Minnesota. I expect you may have to try somewhere other than your regular grocer. MBQ, you asked about using a siphon versus soda water. You probably don’t want to put this into a siphon by itself, since it’s a syrup/concentrate. It needs to be diluted with sparkling water, and that can come from a siphon or a bottle. I’ve see some folks add water first, and then carbonate the whole works in their siphon, but this is far less useful than simply using the siphon with water only. The beauty of concentrated syrups like this tonic is versatility. I use a siphon, but only for water, so I can serve up ginger beer (using ginger syrup), tonic (using this recipe) and of course, top up drinks (like a Collins) all from the same siphon. No sense dedicating it to tonic when I can make everything as needed with just water in the siphon. to obtain a super clear tonic try using a agaragar filter. make ur infusion, i actually 1st make a large Cinchona mix then a few base mixes, mix 1-1.5 grams of agaragar to 500ml liquid. freeze when dropped to room temp. next day take out of freezer and defrost in double cheese cloth. all particals cling to agar and wont pass but flavor particals and water shall. u will hav a very transparent mix sometimes with a slight colour. i then sugar but u will have to use a clear sugar. i am playing round with different form so will update. Awesome, awesome post. I am a huge Hendricks fan, and have found that adding the zest and juice from half a white grapefruit as well as six juniper berries crushed really sets of the tonic. For HangerOne (in love with this distillery; st. George – if you like absinthe, St. George is the best out there) it goes best with the zest of Buddhas hand and a small amount of star anise and lemon balm. Either way, keep up the great posts. FInally found the ingredients, made some tonic water this evening. I do prefer it to the sickly sweet store bought tonics but my major reason was health conscious-seems you have a choice between corn syrup & aspartame otherwise, I do not want either in my diet! Where do I find some of these other brands of gin such as 209? I am anxious to try your ginger beer recipe-as a kid in Outback Aus. my Mum kept a “ginger beer plant” on the kitchen window sill to make home made ginger beer & it was the best tasting thing in the world to a kid on a hot Aussie summer day! I will post back when I try your recipe! Great recipe. How much syrup does this recipe make? grispommeled – This recipe should make just over a quart and a half of syrup. I made this and it is great. I used 1/3 more raw sugar instead of agave, and it came out well. I’ve followed the blog for years and make many of your recipes. But regarding the opacity of the tonic I solved that with some common laboratory items. You need a buchner funnel, filters, a filter flask and some 3/8″ ID tubing (all from http://www.labdepotinc.com), and a hand vacuum pump from a car parts store. Make sure the filter paper fits the buchner funnel. I run my tonic thru a chinois first, then hook up the filter apparatus with a coarse filter, then a fine filter. The tonic ends up clear but still maintains color from the ingredients. All for less than my sodastream. Just finished cooking up my latest batch of this—my friends and I can’t get enough of it. Thanks, Jeff, for this recipe and all the others I’ve culled from your website. For my part, I’ve taken to decanting to do most of the straining work for me. I used to put coffee filters on every clean dish I could find, running around to keep the filters from clogging or breaking, but that got old quick. Now I put my post-boil “soup” through a fine-mesh metal strainer, then let it sit (covered) overnight in a wide-base wine decanter in the fridge. The sludge settles out pretty well, and while I might be ending up with less final product than I would with patient filtering, the simplicity makes it totally worth it. Excited to try this recipe, I picked up a sodastream and my first thought was to make tonic water. Am about to make this for the first time and the bark came in chunks, not powder…but I do plan to use it because it was expensive. So the plan is to whiz a bit in the blender just to break it up and proceed. Maybe with chunked bark, the particulate in the finished tonic is not as much a problem? Just hope the quinine leaches out. Thanks for the basic recipe! In Japan, you can purchase empty tea bags with a fold-over top. I brought several hundred of these home when I moved back to the states. Putting the cinchona in the bags prior to steeping essentially pre-filters the mixture. I suppose you could also use filled teabags, empty the tea out and staple close. Jeffrey – first of all, what a great idea .. I appreciate you hosting this forum! I gathered together all the ingredients this weekend and got busy making my own tonic. I used cinchona bark chips, so I didn’t have the challenges others have mentioned about filtering. My challenge – when I mix together the gin & tonic & soda water … all the bubbles fizz right out of the tonic, and i’m left with a flat (but tasty) g&t. Is there a secret to keeping the drink carbonated? We’ve actually charged the tonic mix directly (with soda stream) and that holds for as long as it sticks around. And is delish. Just an idea vs adding soda water. I just tried extracting the chinchona bark using a vacuum pot and it seems to have worked really well. I put all the other ingredients (but only 2 cups of water) in a saucepan, and the other 2 cups of water in the bottom of the vacuum pot (and the bark in the top). After extracting I have powder in the top and a dark brown non-cloudy liquid in the bottom. I’m going to run it through some coffee filters to see if I get more powder coming out but this seems like a good way to extract the quinine very quickly. I used a Bodum vacuum pot. I have wanted to try out your recepie for a year now and this summer I am finally going to do it! My reasons for wanting to make my own tonic are far different. I HATE how quicky tonic goes flat. I can’t stand flat gin & tonics in bars either. My husband just bought me the ISI siphon so now I can stop waisting all my money on store bought tonic. I am such a bubbles snob. It goes flat immediately even in the small bottles. I can’t wait to make my own. I go to Portland often from Seattle. I’d love to come to the bar. What is it called and where is it? I am planning on bottling this recipe for my friend’s upcoming 30th birthday since he is a big time Gin and Tonic drinker. Any suggestions for me on where to find a bottle to put it in? Something vintage/unique would be awesome! Try eBay lots of vintage bottles & even some soda syphons. Ryan – If you’re in Eugene, I recommend checking out the Down to Earth at 5th and Olive—they’ve got a great selection of fun bottles in all shapes and sizes. For something a bit more vintage, you might check out Oak Street Vintage (14th and Oak); I seem to remember them having a nice variety of funky bottles and decanters. We bottled some infused Vodka once and got some really cool glass bottles that had ceramic & rubber stoppers at Storeables. I’m sure you could order them on line if you don’t have a store in your area. I have the ingredients and I’m rarin’ to go. I have the actual bark (aka Quina — Quina Peel) made by GroMex that I got at a Mexican grocery store. I figured it would save the filtering steps. My question — what is the equivalent amount to use of the bark form versus the powdered form? thanks Jeff! recipe worked like a charm! The recipe tastes a lot better than what you get at a bar or store. Enjoying a gin and tonic now, the gin is No.3 and the tonic water is this recipe. Love it, so much better than the commercial stuff! I zested & juiced 2 lemons, 2 oranges & 2 limes then tossed them all in with everything else & the 4 cups/water in my most recent batch. It makes a very citrusy tonic which my family loves, though probably not to everyone’s taste. I put my recipe on my quilting blog & got some interested responders & sent them to this website. I just ordered the cinchona bark un- powdered so I am keen to make another batch & see if there will be enough bitterness and less particulate in the final product. -added microplaned apple peel and clove for a more autumn-y feel for my bar’s fall cocktails. The additions made it less suited for a traditional gin and tonic, but has had numerous other applications! Thanks for all the inspiration, Jeff! I just did this recipe. But when I added the Agave syrup, the tonic is more liquidy than I imagined. In the recipe it says: “You now have a syrup that you can carbonate with seltzer water.” Mines not syrupy. Am I not letting it reduce enough? or not letting it simmer long enough on the stove? I tried combining the sweetened syrup and water in my iSi Siphon and I get nothing but pure foam from it. Have you had this problem? Don’t put the syrup in the siphon. Put the syrup in a glass, and just spritz the seltzer into it. I have to say I love your site and all your posts I’ve used so many, including your ginger beer, and tonic water. My question is if there is a way to get your homemade tonic water any more clear? I love the way it tastes and with some Breuckelen gin makes the best G&T I’ve ever had. I’ve been to few places who have claimed to have homemade tonic water and it’s clear as any store bought tonic I’ve seen. So is there a way to get it to that clarity using the same great ingredients? Having a bear of a time coming up with the chichona bark. Most retailers are out of stock. Tensing Momo Pike Place is the only source that I could find. Noted a Rueters article dated 12/13/11 that indicates the FDA has given retailers 60 days to stop selling it? Just ordered a pound. Should last a while! Anybody try using a Moka pot to steep and filter the bark powder simultaneously? I think I’ll try this with my first batch. Steep and filter the bark alone as a first step and then boil/reduce with the other ingredients after. I went to a great cooks store and purchased a jelly bag. This bag is used in clarify jellies. Using the jelly bags I get 3 cups of filtrate from the 4 cups of liquid used. Simply rinse the bag when used. Thanks for the jelly bag suggestion! I found them at the local Hardware store in the canning section. Would have used them anyway. 1st batch is cooling and can’t wait for handsome boyfriend and wak-a-doodle dawg to get home and give this a shot. Dark in color, but intriguing! ps…no, Mr. Porter, the dog, does NOT get a G & T! Just got around to trying this having bought a soda stream over xmas and discovered how bad soda stream’s syrups are. Drinking it with 209 right now, not bad but I think I over sweetened it with the agave – the measurements got a bit approximate after the simmering. I got about 3 cups of liquid and added just over 2 cups of agave. Found cinchona bark at Duc Loi (18th & Mission in SF) but it wasn’t powdered. Man that stuff is hard! I immediately gave up with the pestle, tried the coffee grinder but it jammed and ended up using the magimix. Even then I never got it all ground down and I think I have permanent gouges on the side of the bowl. (Anyone else shopping in the Mission you can get the citric acid at Rainbow, by the mason jars above the bulk peanut butter). New find. Cost plus has Melitta tea bags. I have used 4 bags for the cinchona bark and then steeped the teabags with the rest of the goodies. I will still have to strain the potion but the majority of the bark is in the bags. Deborah:I made this last summer and got the actual bark (aka Quina — Quina Peel) made by GroMex that I got at a Mexican grocery store. It was in a clear package and reminds me of cinnamon bark. I lucked into it in Morristown, NJ which has a Hispanic population. Maybe you can find it too. Ciaran: I didn’t bother to grind it at all. In fact, I think having the whole bark makes it infinitely easier to strain. I just used a ‘bag’ of the bark which I think was about an ounce. No need to powder anything so it saves time and makes for a clearer syrup without so many filtering steps. As far as clarity, it isn’t as cloudy but still an amber color, not the clear color of store-bought tonic. I live in Uganda where we’ve had a country wide tonic shortage for 4 months. Unfortunately I also have malaria. I can get quinine pills and IV solution, lemon grass grows around my hut- we have no powers, but we can buy soda water. Can you help put together a recipe for us? I made the recipe and it was great, but the cinchona powder was a pain to filter. Cheesecloth helped a lot, coffee filters were worthless. I finally ran it through my pur camping water filter. It tastes MUCH cleaner and has a bright, reddish-yellow color to it. Has anyone ended up working out a stevia version? Oh, and does anyone know where to get organic cinchona bark, or if it’s even possible to obtain? extensive googling has yielded no fruits. 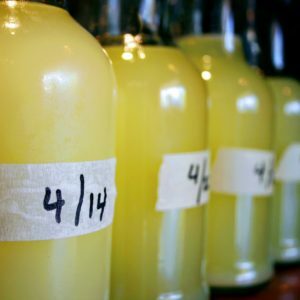 Great recipe – I made many batches and sincerely doubt I will ever buy tonic from a store ever again. Regarding filtering: I use a large colander to filter out the big pieces and then pass the remaining liquid through a metal coffee filter a couple of times. It works like a charm and only takes 10 minutes or so. Also, a passed this recipe on to a friend who used whole bark (not powdered) and he said it tastes just as good. I get the cinchona and citric acid mail order from Herbal Advantage, Rogersville, MO. 3) one run through a coffee filter before sweetening. 4) I ran about 1/2 cup short of agave and so threw in 1/4 cup of sugar. 5) Oh, and I fresh-ground the cinchona in my Braun coffee grinder that I use for spices. As I haven’t tasted cinchona outside of Schweppes or whatever, I’m wondering: how important is it to get every last bit of pith out of the citrus before throwing in the zest? Or is the cinchona really just supplying most of the bitterness that I’m tasting and thinking could be coming from the pith? Agave syrup is sweeter than sugar, not the other way around. So I think that if you were 1/2 cup short on agave, what you should do is dissolve 3/4 cup sugar in water (heat the sugar and water to a boil while you stir and the sugar dissolves, then lower the heat to a simmer and reduce the syrup until you’re comfortable with the volume [so that the mixture will be concentrated enough for your liking]). Since you’ve already added 1/4 cup sugar, you should do this with an extra 1/2 cup of sugar, and then slowly add the sugar syrup until the tonic syrup is of desired sweetness. That is if you really are only 1/2 cup short on agave–notice that the recipe calls for 3/4 cup FOR EVERY CUP OF TONIC SYRUP, not just 3/4 cup. Also, you do need to strain out all of the zest, but I would think a run through a coffee filter would have done that well. The zest will continue to add bitterness as long as it’s steeping. If you can see bits of zest, you need to strain again, IMO, but I am very sensitive to the particular bitterness of zest. Oh, and I didn’t explicitly say so, but I think your bitterness problem is a lack of sugar problem, and not a citrus problem, especially b/c the zest itself lends much more bitterness than the pith. Ah, that’s right, I realized this morning that I’d got the sugar/agave thing backwards. I’ll try reheating with another 1/2 cup and see what that does. The muslin bag prevented pretty much all the pith from actually physically going into the mixture. I was mainly wondering if enough could have infused in to turn the whole thing bitter beyond redemption. Ok, so I tried this with the powdered cinchona, and I simply could not filter out all of the powder. I ended up putting it in my fridge and waiting for it to settle naturally, and then pouring it into another container, leaving a silt-like mixture at the bottom of the first vessel. It wasn’t the most efficient method of filtering ever, but it did work. Then when I was in New York, I bought the cut cinchona bark (not powdered) from Kalustyan’s (yay for a brick-and-mortar actually having this). I used 1/2 cup, but it wasn’t nearly enough. So I simmered an extra cup of cinchona in some water for twenty minutes, removed the bark, then reduced the liquid until it was about 1/2 cup of straight quinine syrup, and added that to my tonic water. Yum! Also, for the sugar-free people, I used 3 cup of powdered erythritol and 1/2 teaspoon of stevia powder for the entire batch, and that was perfect (IMO). I was worried that if I used granular erythritol it wouldn’t dissolve properly, as it does tend to have trouble doing so. Has anyone tried this stuff off of Amazon? Wondering if it’s similar to the cut Cinchona bark that Dora found in New York? I ordered some to test out, hopefully it works! Iquick report on how mine turned out – once enough sweetener was added, it’s pretty darn good in a G&T with Beefeater. A tonic this strong really needs a dry, piney gin though. I first tried it with my home-infused gins, which are more like “lemon/herb vodkas” at the moment because I haven’t yet gotten the hang of getting enough juniper flavor into the infusion. Against this weaker “gin,” and I imagine in a straight vodka tonic. the tonic is just overpowering and the whole thing tastes like I imagine old-timey cough medicine would. So update on the Amazon bark- success! Used my spice/coffee grinder to chop it up a bit finer, worked really well. I’ve made 4 batches with it and have found out a couple of things- I boil the bark by itself for about 30 minutes and filter that with the coffee filters- goes really fast (4 cups of water, reduced down to about 2) and then add that into a pot with another two cups of water and use Organic Erythritol as the sweetener- no calories, no nasty aftertaste- in fact, AWESOME!! Super stoked to finally have a diet no calorie tonic that tastes good. After making the mistake of reading a bottle of tonic, I wanted to try my own. Haven’t yet, need to get the bark. http://Www.pennherb.com – you can get most of the herbs, including the bark. They have a brick and mortar store in Philly if you’re local. http://Www.herbalcom.com – bulk herb supply. Get my tea, stevia, citric acid, and other herbs from. I didn’t see the bark there though. http://Www.prairiemoon.com – beverage supply. If you got one of those glass and mesh siphons on eBay, you can most likely get the charger holder here. If you have trouble getting kosher salt, pickling/canning salt is also just pure NaCl, just a finer grind. 1/4 cup powdered bark = 1oz. So if you need to substitute whole or chunky, use 1oz. Craft stores and pier 1 are also good bottle sources. I’ve found good ones at thrift stores and yard/garage sales. Has anyone tried using the Soda Stream machine instead of a soda siphon? Just made this, and can’t wait to sample the results! Thought I would share this tip: if you aren’t familiar with the Aeropress (which makes an amazing cup of coffee), it is like a French press, but uses a small paper filter. Since you have the ability to pressurize the liquid tube, you can force the tonic mixture through in about 3-4 minutes and get out all the solids. I filtered the tonic water successfully using my Aeropress, and got a very clean liquid for the tonic – I also ended up with a 1/2-inch “puck” that looked pretty cool . . .
@Petro, What a great idea, I’ve got an aeropress, but when I make this I normally use a french press. I think I’m going to try with the aeropress next time. I’ve been using this formula for a couple years. This time I’m going to try something new. Because I add a bit of Vodka into the liquid in the fridge to help it keep (… and I do not add the agave/simple syrup until I am decanting a cup to use), I’m infusing small amounts of vodka with different spices (coriander, cumin, rosemary, and cardamom) to try to see if these accents go better with different gins (Junipero, Aviation, Hendricks, etc.). I’ll add a tablespoon of the infused vodka to a cup of the unsweetened tonic. I’ll leave out the allspice. Made up a batch and, even though I don’t care for tonic (my BF does) I tasted it against a bottle of Canada Dry sitting in the fridge and it was pretty close. To get the peel, I used a vegie peeler rather than zesting all that fruit. I strained it through cheese cloth. Keeping it in the fridge though I may add a tetch of everclear to the next batch to help preserve (though with all that citric acid, I doubt its necessary). Had to reassure the people I gave it to taste that “brown” (IMO its more rust) color is OK!! Homemade stuff is often a little different looking than commercial made. Just made some of this tonight, what a great thing. Thanks for the recipe. I bet this page is driving 98% of Peruvian bark sales on the Internet. Okay, so I’ve tried this recipe twice. The first time I followed it exactly. Results: SUPER bitter; completely undrinkable. The second time I cut back on the cinchona bark powder & didn’t steep as long. Results: SUPER bitter. I had to add a lot of sweetener just to make it “somewhat” palatable. I’ve had some homemade tonics at locate bars in Mpls, and this isn’t even close to those. HELP. Any suggestions? When you’re doing the citrus skins, are you getting NO pith (white stuff)? That will make it bitter. I used a peeler (like what you use for potatoes) and used that to get the colored part of the citrus skin. I also used cut bark instead of powder (1oz of bark) which is easier to strain out. Tried looking on the other comments if the topic was covered before. Any stores in Portland, OR that have cinchona bark? For those troubled by excessive bitterness, like my wife, try removing as much of the pith from the zest as possible. Varying the amount of quinine also helps control bitterness. Whata a interesting post!! Its pretty easy to understand and to follow the recipe…we surely try it!! That’s each cup, not the whole batch. Atalanta — the ratio of powdered bark to cut and sifted wouldn’t be 1:1 because the powder has tons more surface area to give up it’s flavor as you infuse. The bark itself will take way more to get the same flavor, but it also won’t leave so much debris behind. You’d have to compare prices to see which would be more cost effective. Zahchary – I took the name of the bark into a Chinese Herb Shop (Wing Wang on SE 82nd near Fubon). They looked it up and found the Shinese name for it. The bag had a different English name on it – they said the English name was wrong. They sold me a pound of the bark in a paper bag. It worked great. I did grind it a bit in a coffee grinder before using it. Worked great. I’ve been enjoying making this recipe and tweaking it each time. Next batch will have some juniper berries in it. Anyone have any suggestions on how much to put in? Don’t want it to taste like a Christmas tree, but would like it to be subtly flavored. Can anyone tell me if this will work with Cinchona Bark Tincture instead of bark? 1) Put the herbs and bark in a muslin. No muddy mixtures. 3) I got this from the herborist after a translation mistake. Combretum micranthum. It is african, leaves instead of bark. Should give the bitters with less wood. Next time am going to replace half of the bark with this. Last night I must have made 10 different batches of tonic syrup using this recipe along with some others, including the Imbibe magazine one. I have to say, using the cut & sifted bark is so much more practical and less time consuming. I used double what the recipe calls for in powder, and it strained out of there with ease. Look for it on Amazon.com, search “cinchona” and see what comes up. I also made a batch where i threw an entire pack (1.2oz) of freeze dried strawberries in the pot, also added a pinch of cardamom seed. Unreal. Get creative people! I finally found a seller in Honduras on eBay who sells the bark whole, a pound at a time. You have to bash it up yourself, but what you leave whole will last better than when it’s already cut or, especially, powdered. They also have raw cacao beans, so I’m going to try making my own Creme de Cacao or something similar. Tasty. I found the 1oz of cut bark to work well for me. It’s small chunks rather than powder. FYI I get my herbs from Penn Herb (www.pennherb.com). They tend to have a lot of the more esoteric stuff, like the cinchona bark (choice of cut or powdered). I made a batch of tonic syrup the other day using a bit of a lot of online reciepes. found somthing that really cut down on filtering time using the powdered bark. I made little “tea bags” out of some coffee filters wrapped in cheesecloth, trust me it was NOT that labor intensive. I travel so much for work that I hate making things hard when I am at home. I added an extra cup of water and let the “bags” steep occasionally pressing with the flat of a spoon. Worked out great. Since I don’t drink a lot I then took equal measures of the water and froze it rather than add syrup right away. So like now, when I’m finally home, let a batch thaw, heat up, add sugar and then bbq with a cold gin and tonic in hand!!!! Excited to try this, I gathered ingredients – including powdered cinchona from herbaladvantage. Followed the recipe, but I don’t taste the bitterness at all. I made a batch of just steeped cinchona by itself to try to isolate the problem, and there is no bitterness at all. I think folks here may be confusing sourness and acidity for bitterness. Could this be a bad batch of cinchona? Shouldn’t it have some bitterness on it’s own? Any suggestions would be helpful. Thanks. This is a great recipe! We add the syrup to a cocktail shaker with 2 cubes of ice and Gin. Shake and pour into glasses (with ice) and pour Club Sode (small bottles so they have alot of fizz)…the best!!! Time to make another batch! Opps. I meant Club Soda! got to be bad cinchona. the steeped cinchona by itself should be intensely bitter (not sour). i want to send these to some people but it might take a day or two to deliver…will they still stay good if theyre not in the fridge during that travel time (i plan to splash some vodka in to stretch out their shelf life)? Having read through all these comments about how hard the straining process is, I’m now wondering if I did something wrong. I made a batch of this tonic yesterday for the first time (I’ve just recently discovered the joys of g&ts,) and it worked like a charm. I passed it through a normal strainer, then a layer of cheesecloth, and it was a beautiful clear amber. The taste was heavenly, but a bit heavy on the agave for my taste. I rather like the bitterness, so I’ll put less sweetening in next time. I used a chinchona tea I bought from Amazon. It was listed as “powdered” bark, but it was more like small, hard pieces. Does it come in a more “powdery” form? Anyway, thank you, Jeffrey, for providing this recipe. It’s a true nectar of the gods! Apologies for “necroing” the thread, but I just wanted to say a huge thank you to Jeffrey (and all of the other thread contributors). I just made my first batch with small tweaks, most particularly substituting cane sugar for the agave syrup, and it’s delightful! I too obtained a 1lb bag of the cinchona bark via Amazon. I’m going to experiment with reducing it to a finer consistency without turning it into powder. As others have said, it’s fairly tough stuff. As it is, I just hand sifted out some of the finer bark from the bag. The quinine extraction seems to be pretty much perfect. There’s a distinct bitterness, but not to excess. I am very excited to try making this tonic syrup. My husband has Leukemia (CML) and takes a miracle pill once a day that keeps it totally under control. Unfortunately the miracle pill comes with side effects. Excruciating muscle spasms. Dr.”prescribed” Tall G and T’s are daily medicine…often drunken in beer steins at bars to get enough quinine. So my question. How much Quinine is there in 3/4 oz of syrup? No point in upping the taste and lowering the sugar of his G and T’s if he doesn’t get his required quinine fix! I am in the process of making my first batch. I, too, had roughly cut cinchona and just went at it a bit with my mortar and pestle, leaving some chunks. Was a little heavy handed with that and the lemongrass as it is summer and I thought a nice bitter syrup would go well with The Botanist. I’m writing because I had no problems straining my mixture with a muslin cloth draped inside a sieve. Worked like a charm with the hot mixture and will be easy clean up too! 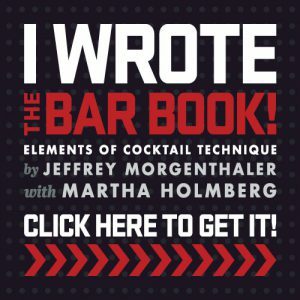 Jim_cat and others, the Bar Book is out and it does indeed have an updated tonic recipe. I just finished making it and I have to say, I DO like it better. In many ways it’s simpler: fewer ingredients. It also opts for making a cinchona tincture rather than a full steep in hot water. This make so much sense and adds a level of control over the bitterness at the end. It’s also a bit lighter in color and remains clear (though still dark enough to prove it’s house made). I’ll be making the new version from now on and I encourage everyone to buy the book and try it! Thanks, Randy! I’m much happier with the version in the book. Thanks Randy! On it’s way via amazon! Here is the link for others. Hi Jeff, what a fabulous blog, 5 years old or more and still going. I have just made batch no 2. Following Jeffs recipe. Good gear it is too. Perfect for the long hot summers down here in Aus. Being a huge fan of G&Ts I’m preparing to make my own tonic per your recipe. As a professional chef I’ve had so many people approach me recently to ask about specific ingredients as they relate to health issues. Recent research as shown that the high fructose content of agave syrup is dangerous for our livers (agave contains more fructose than high fructose corn syrup). Therefore I intend to try this recipe with honey as the substitute. OK, call me a sick puppy but I’m now going to try carbonating gin-plus-syrup in my old Sparklet soda fountain – no extra water. Shazam! more than a pint of ready-to-drink max-strength G&T! Im trying to find a good tonic out there to make an espresso tonic (http://www.tastingtable.com/entry_detail/national/17507/Coffee_Tonics_Are_the_New_Iced_Coffee.htm). Has anyone ever tried one? I am finding citric acid hard to find here (Bahamas). Is it possible to up the amount of lemon juice as a substitute? Or can anyone suggest an alternative? Thanks for the post. I tried this recipe a couple nights ago, and the result was certainly a tasty tonic, but not nearly as bitter as I was expecting. I powdered the bark in my spice grinder to increase the surface area, and I conducted the extraction as directed for 20 minutes at 100 C. I do realize that quinine levels can vary in cinchona barks, but still I thought there would be more bitterness, especially given Camper English’s (alcademics.com) calculations suggesting that the quinine content in your recipe could easily be above the CFR specified maximum 83 mg/L (for commercial beverages) by a factor of 15x. Do I just have a really week batch of cinchona bark, or do the most popular commercial tonics contain other bitter “flavorings” that raise the bitterness. Been a GnT drinker for awhile and just dabbled in your recipe. It is fantastic and can’t wait to add my own spin. Thanks! I’ve been making this “brew” for a couple of years now and am thoroughly addicted to it as the best tonic I’ve had. The filtering process has always been time consuming and messy but this year I found some good techniques that reduce the process to about a half hour. After cooking the tea I strained it through a wire sieve to get rid of the lemon grass and fruit zest, etc. I put it back in the pot, put a cover on it and left it on the stove overnight to settle. Today I skimmed off the liquid with a ladle and put it through a coffee filter press. When I got to the “mud” at the bottom of the pot I layered about four paper towels and formed a cone with it. I poured the mud into it and gently squeezed out the liquid with my hands until all that was left was a thick cinchona paste in the towels. Back on the stove to heat, added the agave and all done. I no longer dread running out of syrup since I’ve cut the prep time in half. This is great with Gin but IMHO not with Vodka. It just doesn’t do it…. Is there a tonic recipe available for Vodka? As soon as I get a hold of the cinchona bark, I am going to follow your recipe. One question, though, as to the citric acid: What does it do to the tonic (flavour, colour or preservation?). What will be affected, if I do not use citric acid? The citric acid prevents the sugar to fall out and also preserves the sirup. After a while, it might also result in the loss of color. Reading Tom’s post from several years ago, I acquired a 2-micron Buchner filter. The filtered results were crystal clear, but the filter is too fine for cinchona powder (I was guessing) so I had to clean it repeatedly. In a perfect world I would experiment with 5u and 15u filters and report back. Acid pirhana mix (3:1 ratio of conc. sulfuric acid an 30% hydrogen peroxide) is your friend when cleaning these things, but don’t use it without studying how to first. It can get quite hot, but in the quantities needed here and with proper care and ventilation one can be safe. Don’t be cavalier. Hello! Just discovered your site and this tonic is the first of your projects I’m attempting to tackle. At this time of year, it seems to be difficult to find fresh lemongrass in my area– do you think that powder would be an acceptable substitute, and if so at what ratio? If not I’ll just hold out until I can get the real deal. I’d say hold off on the lemongrass until you can find the real deal. It’ll work just fine without it. Promise. I love that you respond timely on an article that is 10 and a half years old! How long will the syrup be good for? I’ve made this before but I went through it pretty quickly. I got my hands on some Bergamot so I want to make a big batch and hold on to it. Should last a week or so!